As a steam iron on the more affordable end of the price spectrum, functionality and reliability still play important roles for the reputations of a brand. The Rowenta DW2070 Effective Comfort steam iron is targeted to those on a budget but still want a quick, simple and reliable performance. Find out in our review whether this steam iron is as good as reports claim and how it fares with other budget steam irons. Relatively Powerful – When compared with the rest of the budget steam irons, the Rowenta DW2070 ranks among one of the most powerful at 1600 watts. 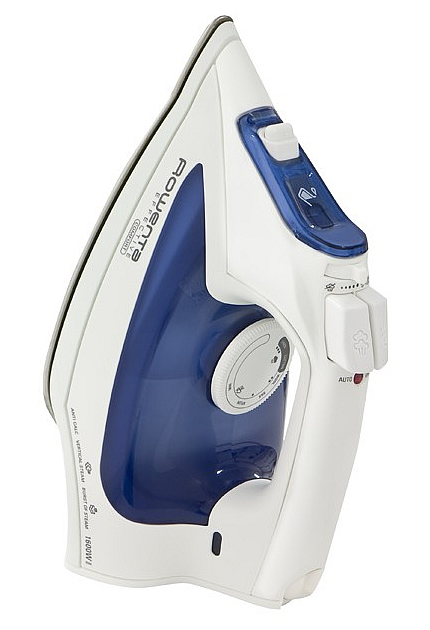 Smooth Gliding Soleplate – Its Microsteam stainless steel scratch resistant soleplate provides great gliding capabilities when ironing, making things easier for you. Ergonomic Design – The large buttons and knob, easy to hold handle and pointy tip all result in an iron that’s easy to maneuver and operate. Excellent Value For Money – With the amount of features that this iron has, you’ll be hard pressed to find another steam iron that’ll give you more bang for your buck. Dimensions 11" x 6" x 4.75"
The people that know the most about a product is those that have actually used it consistently over a period of time. 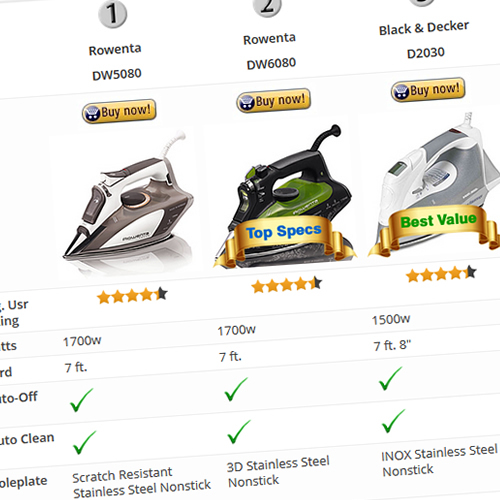 We’ve researched over 80 real user reviews to highlight the positives and negatives of their experiences with the Rowenta DW2070 Effective Comfort steam iron. 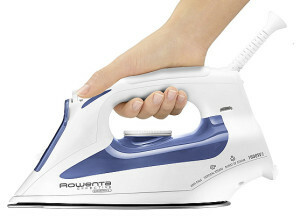 A great ergonomic design and effortless ironing soleplate are highlights of the Rowenta DW2070. Large and easy to hold thick handle with thumb rest, and it has two large buttons at the front for the steam and spray. Large adjustable rotating knob just below the handle which is easy to turn and read despite being underneath the handle. 360 degree pivoting power cord located at the back of the handle. It’s 7 ft. long which is average for a Rowenta steam iron, but a bit shorter than other brands. It would have been better if the power cord was retractable also. Pointy tip which is designed to allow the user to maneuver the iron easier. There are very few design flaws thanks to good research and development by Rowenta. However, the front plastic flap where water is inserted can be improved, as some users have mentioned that it can snap off if used too forcefully. Also, this steam iron is slightly on the heavier side (3.5lbs) when compared with other steam irons, which makes for good pressing of clothes but adds a bit more strain for those with hand problems. 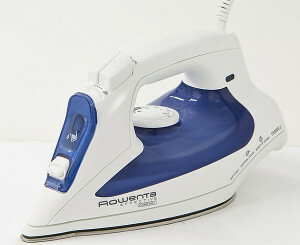 Keeping with the design of other Rowenta steam irons, the DW2070 has a stainless steel and scratch/stain resistant Microsteam soleplate which has 300 steam vents, designed to provide a more effective (not stronger) and more evenly distribution of steam. There’s a lot of praise with Rowenta’s soleplates and that’s due to its round edged featured around the entire soleplate, and its pointy tip. 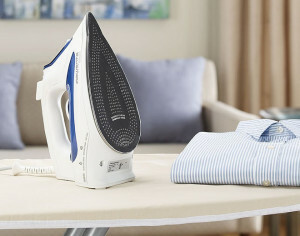 Both of these elements makes it possible for an easy maneuvering and smooth gliding ironing experience. Rated at 1600 watts which is more powerful than most budget steam irons. It also has an anti-calc and self clean system. Rated at 1600 watts which is higher than most steam irons within the same price range, the DW2070 heats up quickly for better efficiency. There is a majority praise in regards to the stainless steel Microsteam soleplate which has proven to be very good at gliding across different types of fabric thanks to its non-stick surface. It has an auto shutoff function where the iron will turn itself off after 8 minutes when it’s left in an upright position, and 30 seconds if it’s tipped over. It features an 8.75oz water tank, a respectable capacity but not as much as some of Rowenta’s other models. To prevent calcium build-up in the reservoir, there’s an integrated anti-calc system which removes all the impurities to increase the iron’s lifespan. It has a good spray function which provides an even mist spray unlike a spurt which is seen on other budget steam irons. Despite having a vertical steaming capability, it’s not very effective as it is when positioned horizontally. This is simply because the steam is just not powerful enough. 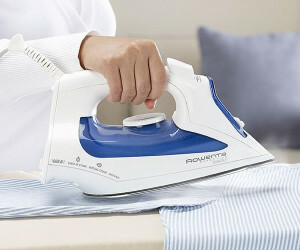 A common complaint among users is that this iron is prone to leakages, especially when the heat and steam settings don’t match (which can be said for many steam irons) or the water tank is too overfilled. Just like most other Rowenta steam irons, the DW2070 has an integrated anti-calc system and a self-cleaning system that flushes out loose mineral deposits from the water tank via its steam vents. This just makes it easier to main the iron itself. However, you would still have to take the proper measurements when it comes to using the correct water. The instructions (which is said to be unclear since it mainly features images with very little text) state that tap water must be used, though some users have use distilled without any problems. It’s still probably safer to just follow the instructions. At the time of writing, the majority of customer user reviews generally positive. Though it’s not one of the higher rated budget steam irons around, it’s still one of the bestselling due to its ergonomic design, top-notch soleplate and excellent price point. It would be the perfect budget steam iron if not for the few flaws that it has. All in all, if you are looking for an affordable steam iron that will give you good value for money, the Rowenta DW2070 Effective Comfort steam iron is one of the better options. Alternatively, we also highly recommend that you check out the Black & Decker D2030. Click Here To See The Live Prices On The DW2070 Effective Comfort Steam Iron Today!